Mens Bracelets are an essential part of a complete wardrobe and can help you show off your personality and your temperament. Below our design team provide many suggestions to answer some frequently asked questions, to help any man find his new favorite bracelet. A bracelet is a part of jewelry that is worn around the wrist of people. Bracelets may use for different purposes, such as being worn as an ornament. When worn as ornaments, bracelets usage get a supporting role for the rest items that you wear. Some people use them as charms, medical and identity. Some times they encompass by information such as allergy bracelets, hospital patient-identification tags, and tags for newborn babies. Bracelets may be worn to indicate a specific phenomenon, such as breast cancer awareness, or for religious and cultural aims. If a bracelet is simple display, rigid loop, it is usually called as a bangle. When it is worn around the ankle it is called an ankle bracelet or anklet. Also, there are boot bracelets that is used to decorate boots. Furthermore, there are handcuffs that sometimes called bracelets too. Bracelets are made from metal, cloth, bead, leather, plastic or some other materials. Jewelry bracelets most of the time comprise rocks, wood, jewels, metal, shell, crystals or plastic hoops, pearls and other materials. We offer bracelets in a wide variety of types, so you can find whatever kind you want. We are ready to guide you in our collections,to help you find out what you really want. Let’s start with the bangles. Bangles have a circular shape and are unbending. They are usually made of gold or some others metals, and can come in simple or sculptured designs. Most common, they are made of diamond, or they are embellished from gemstones bangles, or they contain a bundle of different tones for a separate look. Leather has served countless roles in our society for centuries. One of the main functions of the durable material today is in jewelry making. K & M ’s collection of leather bracelets includes clean, modern finishes as well as rugged designs. The vast majority of leather bracelets at K & M Boutique are made from 100% cowhide leather. Most of the bracelets we sell at K & M Boutique are made of the best quality top layer leather. We provide high standards with the finest quality leather in the market, keeping the wonderful leather scent. Our Team craft high quality bracelets that suit perfect. Stainless steel is an alloy of Iron consist of Chromium. Chromium produces a layer of oxide on the surface of the steel, also known as a passive layer. This material protects the bracelet from any surface corrosion. Increasing the amount of chromium increases resistance to surface corrosion. All Steel Bracelets available at K & M Boutique are made from stainless steel, better known as surgical steel. 316L Surgical Steel is a very high quality material that is mainly used for the manufacture of jewelry. It keeps its brilliant shine and polished beauty for many years and is very resistant to wear, rain or snow and even perspiration. Beaded bracelets have greatly increased their popularity lately and they are viral. We offer beaded bracelets consist of lava and natural stone beads. There are no duplicate bracelets and each one is unique in itself, because we make them from natural and lava stones that have different texture and color. Our men’s beaded bracelets are often made of beads in diameters of 6mm, 7mm or 8mm. They usually made from loose beads with a center hole and connected by a piece of sting or elastic band through the holes. Boy’s bracelets are also made from these natural materials, so all beaded bracelets are good for males of all ages. If you have very small wrists or are looking for small men’s bracelets, you can use a measuring tape then consult the chart at the top. The majority of young males have wrists like 15 – 17cm. Our sizing guide will help you to determine the size that will fit your wrist. 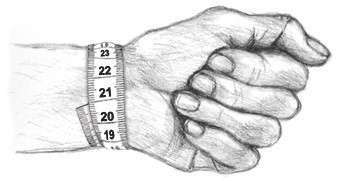 The best way is to measure the wrist just above the wrist bone, then add 2cm as shown here. The tape you will use to measure your wrist should not be tightened to the full. We offer a wide variety of bracelets and one of the features that distinguishes them and separates them from each other, are the types of locks that they are equipped with. On this page you will find information about the types of locks that our bracelets have. The bracelet is locked with a round knob that you need to push on the pre-punched holes to keep the leather bracelet in several locking positions. There are also plastic insert locks on the sporty bracelets. The magnet locks provide an extremely secure lock so you can even safely wear your bracelets in your day-to-day activities. The magnet locks covered by a twist locks for double security. True to its name, a magnetic clasp consists of two pieces that have magnet. These magnets attract one another and snap together, locking the piece of jewelry in place. There is a great variety of magnetic clasps available in all shapes, sizes, and styles. Some are small, round, and delicate, while others are large and rectangular. Still others are texturized or accessorized with rhinestones and more.